Raith Rovers booked their passage into the 4th Round of the William Hill Scottish Cup tonight after a 7 goal thriller against Airdrie United at Stark’s Park. 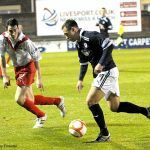 Raith had one enforced change from the weekend win over Falkirk with Joe Hamill replacing David Smith who linked up with the Scotland under 21 squad in Portugal. Airdrie manager Jimmy Boyle on the other hand made 5 changes from his sides 3-1 home defeat by Livingston on Friday night. Boyle’s wholesale changes immediately paid off for Airdrie as they took a surprise lead after just 2 minutes. Josh Watt picked up the ball wide on the right, 30 yards from goal. As the defence backed off he cut inside Malone and curled a superb curling shot past Laidlaw into the top right hand corner. Whilst it was a disappointing start for Rovers the home fans didn’t have to wait long for an equaliser as it came after 5 minutes, with a well worked but simple move. Clarke played the ball to Grant Anderson who hit the bye line and found Greig Spence unmarked in the middle who tapped it into the unguarded net. After the whirlwind start the game started to settle down but both teams came close again before the first quarter of an hour had been played. First Ryan Donnelly made space for himself before testing Laidlaw with a 25 yard drive. Then Grant Anderson crossed for Clarke who did well to knock it down for Spence, but after beating the defender and finding himself through on goal he snatched at his shot and allowed Arthur the opportunity to tip over. Raith took the lead after their next good move on 20 minutes. Joe Hamill’s back heel on the left hand side allowed Eddie Malone to feed the ball into Simon Mensing who was challenged clumsily by Keiron Stallard inside the penalty area. 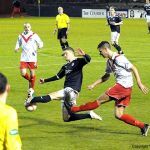 Referee Stephen Finnie pointed to the spot and captain Allan Walkerstepped up to strike the ball cleanly past Arthur into the keeper’s bottom right hand corner. Despite Raith’s lead Airdrie had arguably the games most prominent player at this point in Josh Watt and the on loan Motherwell player showed his skill just a minute after the goal, nutmegging Malone and sending in a dangerous looking cross that Mensing just managed to clear. 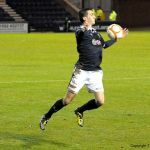 Airdrie keeper Kenny Arthur then had to be replaced by Andrew Duncan after he appeared to pick up an injury while making a routine save. 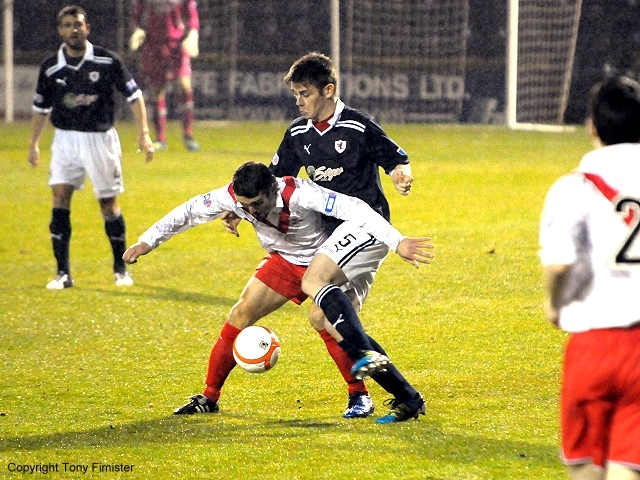 The 20-year-old was making just his 3rd appearance for Airdrie. 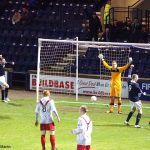 Raith were unable to test the inexperienced keeper though as Airdrie started to boss the game, although without creating anything clear cut. 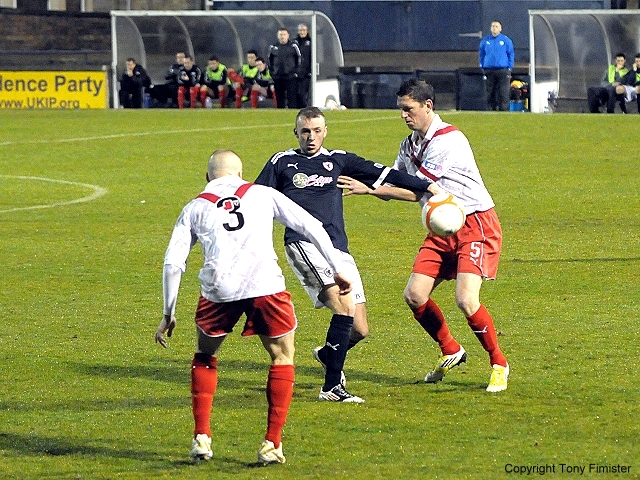 Watt was by some margin their best outlet and he again caused panic amongst the Rovers defence just before half time. Despite Joe Hamill and Malone doubling up on him he still managed to evade their challenges and find Di Giacomo in the box, his effort was blocked by Laidlaw and Bain’s follow-up from the edge of the box was brilliantly blocked by Thomson for a corner. 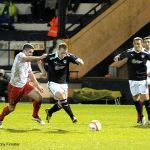 Raith couldn’t hold on though and were pegged back in injury time of the first half after Airdrie were awarded a controversial penalty. A free kick from the left was flighted into the box and despite no appeals from the Airdrie players, referee Finnie adjudged that Laurie Ellis had pulled Buchanan in the box. 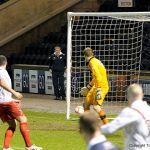 Di Giacomo sent the ball to Laidlaw’s right as the keeper chose to go left, firing Airdrie back into the tie which, on the balance of play they probably deserved. 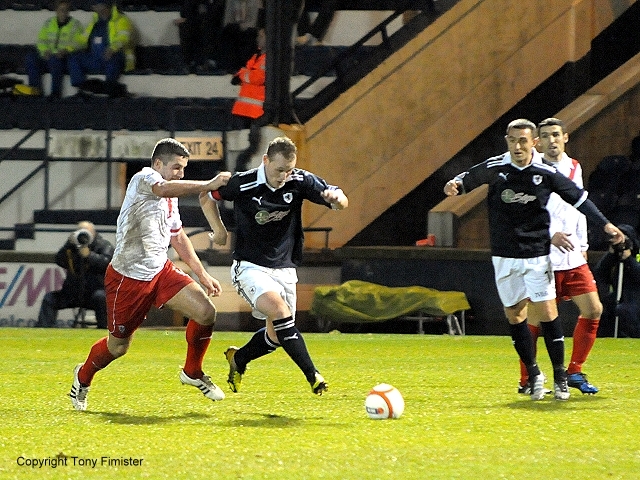 Raith began the brighter in the second period and almost went in front again 5 minutes into the half. A long ball forward was pounced on by Spence but his lofted shot appeared to strike Duncan in the head. That still wasn’t the end of Airdrie’s worry though as Grant Evan’s header back to his keeper was somehow misjudged by Duncan as he allowed it to roll past him, eventually gathering it as Spence hovered. Spence’s movement was proving a constant nuisance to the Airdrie defence and his good work almost saw Rovers take the lead in spectacular fashion. Holding the ball up he played it back to Malone who’s 30 yard shot was tipped wide impressively by Duncan. The keepers good work was undone just a moment later however as Rovers took the lead again in the 55th minute. Grant Anderson received the ball in the wide right position and hit a fierce shot that everyone, including Duncan seemed to leave, allowing the ball to travel unhindered into the bottom right corner. Airdrie were anything but out of it though and almost snatched an equaliser when Pat Clarke was called into defensive duties, clearing a Nathan Blockley header off the line following an Airdrie corner. The same Rovers player was then at the heart of the action at the opposite end of the pitch, toe poking the ball past Duncan but it lacked enough pace, allowing Buchanan to slide in and hack the ball off the line. Grant Murray made his first substitution with 16 minutes remaining, bringing on Stuart Anderson for Hamill. The replacement went into the middle with Mensing while Walker went to the right and Grant Anderson swapped over to the left-wing. If anything however the swap seemed to unsettle Raith. Despite Grant Anderson, their best attacking option up to that point, swapping sides they persisted on using the right hand side. 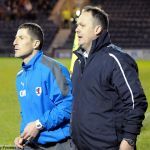 Allan Walker was making less headway against the Airdrie left back and as a result Rovers started to give away possession, allowing Airdrie to build up momentum as the game entered its final stages. Mensing just managed to keep the ball out the net with a few minutes remaining but while the Airdrie fans behind the goal appealed for handball the referee waved play on. The same supporters were celebrating just a few moments later though as the away side drew level once again. A deep free kick was swung into the box and with the Raith defenders at sixes and sevens Gregor Buchanan rose unchallenged to send a header past Laidlaw. 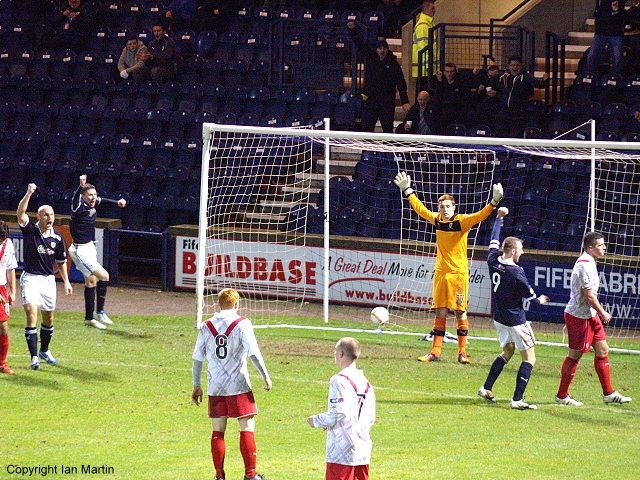 Raith almost snatched the win in the last-minute of normal time. Duncan came sprinting from his goal to clear a through ball but his mis-hit attempt fell to Walker whose audacious lob from distance bounced the wrong side of the post. Despite the disappointment of the late equaliser it was Rovers who looked the more likely to take the lead at the start of extra time, carving out some early chances with Allan Walker at the hub of them. Firstly he was played in by Clarke but his angled shot went wildly over the bar. Then his deep cross was palmed nervously wide by Duncan, who again didn’t look too confident as Walker swung the corner in, almost dropping the ball at the feet of Spence. 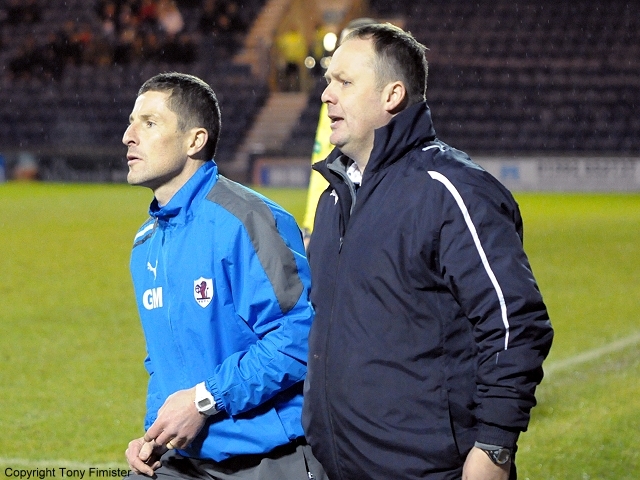 Raith were rewarded for upping their tempo when they took the lead for a third time in the 98th minute. Walker was again involved, sending in a corner from the right that was met by Hillwhose powerful header took a deflection past Duncan into the top left hand corner. Man of the match Grant Anderson almost sealed the game 5 minutes later. Walker held the ball up at the corner flag before playing it to the ex-Hamilton man who looked up and jinked past 3 challenges before somehow contriving to sky his shot over the bar with just the keeper to beat. Anderson eventually left the field to a standing ovation with 8 minutes left, replaced by Ross Callaghan. Both teams looked visibly drained as full-time approached but Airdrie had just enough time for one last effort, an acrobatic attempt from substitute McLaren who volleyed just wide with his back to goal. The full time whistle was a welcome relief to the Raith players and fans who could at last look forward to a 4th round tie with Deveronvale at home at the start of December. While manager Grant Murray may be concerned at the amount of goals his team is conceding he’ll be delighted at the regularity that they’re finding the back of the net, incredibly Rovers 19 games this season have yielded 73 goals. With the Fife derby up next against a Dunfermline side that’s just conceded 5 against Partick Thistle, theres a chance that Saturday’s match could be laden with goals as well. Raith playing towards the North Stand, Airdrie kick off. Early injury to Airdries Bain. Airdries Watt shoots from the corner of the box and puts the ball past Laidlaw. Spence scores from close range. Difficult conditions, rain falling steadily. Donnelly shoots from outside the box into the arms of Lait. Anderson heads into the box but Arthur slide out to save. Spence shoots from close in, tipped over for a corner. Clarke shoots wide from a Malone pass. Anderson skips past his marker but fires over the bar. Penalty, Walker stepwise up and shoots low to his left, goal. Bain misses from a twenty yard cross. 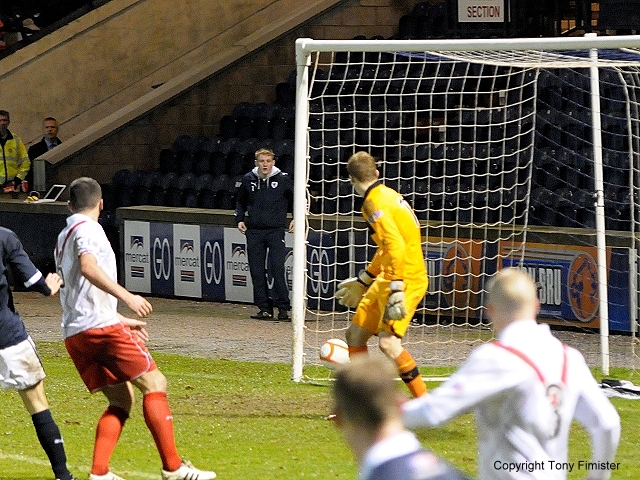 Raith survive a melee in their own box, then the ensuing corner. Malone robs Di Giacamo just inside the box. The rain has stopped but the ball is skimming about. Walker crosses from a corner, Claw shoots high and wide. Bain tries a shot at Laidlaw's near post, but Ross collects. Thomson blocks shot from Bain who fired in from fifteen yards. Another melee in the box sees Laidlaw cover the ball well. +2 penalty for Airdrie after Ellis was judged to have fouled. 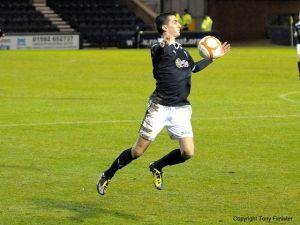 Di Giacamo puts the ball past Laidlaw. Thomson crosses to Spence who's header is collected by Duncan. Spence was unlucky there, played through but denied by Duncan inside the six yard box. Spence lays the ball off to Malone who shoots across the goal. Anderson scores from twenty yards out. The greasy pitch is making some passes unreadable. Watt beats Malone but shoots wide. 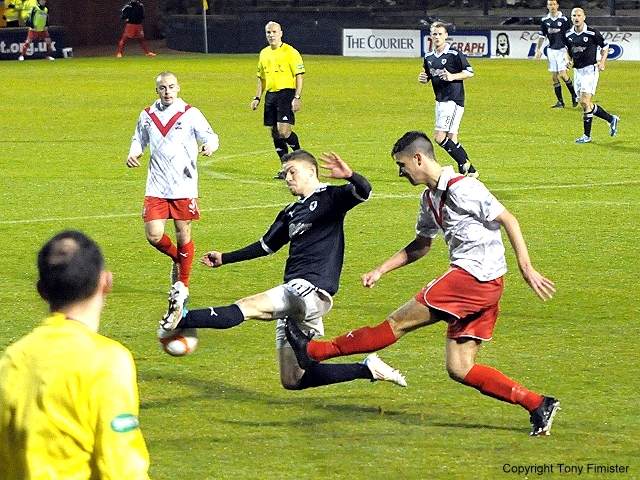 Airdrie threatened with a cross into Donnelly he heads wide. Anderson threads a cross into Clarke, but hits the final ball just wide. Anderson clears a corner off the line. Spence on the attack lays a diagonal pass to his partner Clarke but the ball is intercepted. Hamill off for S. Anderson Di Giacamo off for McLaren. Clarke played on Spence but he was denied by Duncan. 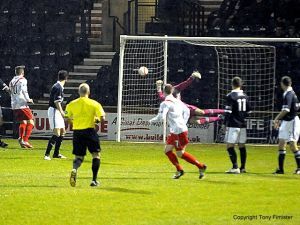 Airdrie having a spell of pressure, trying for the equaliser. Airdrie get the equaliser. Buchanan scores with a header from close range. Walker attempts the impossible, the goalkeeper off his line, he shoots from the halfway line, but the ball floated past the post. First half, Rovers shooting south. Pat Clarke plays Walker through, his shot goer narrowly past the post. Calls for a penalty as Thomt goes down in the box, play on. Walker corner meets the head of Dougie Hill, goal Rovers. G. Anderson shoots just past the post. Walker wins the ball in the corner and plays G. Anderson through but shoots over. Some of the players looking tired. Grant Anderson picks of a pass and runs 10 yards but shoots wide. Laurie clears the ball for a corner and clears the cross by heading the ball out. G. Anderson runs twenty yards and passes to Walker who sees his shot blocked. G. Anderson off, Callaghan on. Laidlaw saves a shot from close range. 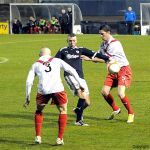 A typical gritty cup tie. I hope the guys can recover in time for Saturday. Laidlaw, Thompson, Malone, Ellis, Hill, Mensing, G. Anderson, Walker, Spence, Clarke, Hamill. Subs, S. Anderson, Callachan, Vaughan, Donaldson, Roberts. Arthur, Evans, Warren, Buchanan, Lilley, Stallard, Watt, Blockley, Di Giacamo, Donnelly, Bain. Subs, Griffin, Jack Boyle, McLaren, Lamie, Duncan.